Steven has been capturing weddings with video since 2009. He has had the honor of documenting hundreds of weddings and other events over the years. He has a passion for video and compassion for everyone he has the pleasure of working with. This beautiful couple met in the military and were married in the very building they first saw each other! When Samia saw Daniel walk into the room at the Armory in Tonawanda, NY she said she knew she was looking at the face of her future husband. After the Armory was retired and re-branded as The Tonawanda Castle they just knew they needed to get married there. They flew up from Texas a week early for their ceremony on May 6, 2016. They were able to get ready, have their ceremony, and the reception all in one fantastic, unique location. It was quite the workout running from the 1st to the 3rd floor with all the camera equipment, but it was worth it. We loved being part of this wonderfuloccasion and you could just feel the love for each other and their friends and family in the room. The ceremony was so sweet and meaningful as they wrote their own vows. Afterwards, we were able to take a group picture in an area that was previously off limits to the soldiers. We were able to use many nooks in this great old building for some fun pictures before they were announced and got to dance the night away! They will be enjoying many years full of love and laughter, I’m just sure of it! Marsha & Luis were married on May 6, 2106. It turned out to be a warmer day than expected but the bride and groom of Buffalo were as cool as could be with their family and friends. 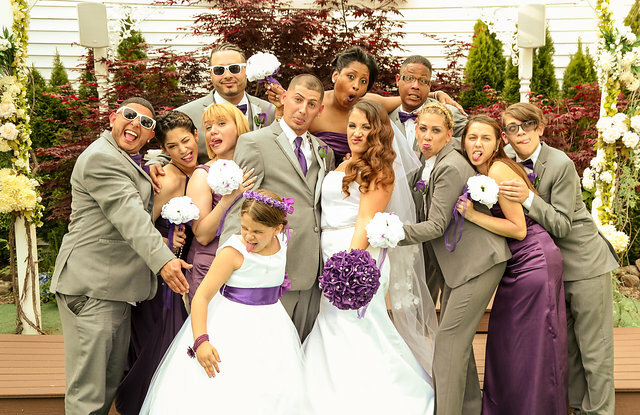 They bridal party wore purple (our favorite color!) The bridal party waltzed down the aisle in style. Marsha was beautiful in her wedding dress while Luis looked very handsome. The party that night was a fun affair. We were fortunate because the outside ceremony was nice and dry but the rains came later that evening, but who cares, we were inside having a blast! 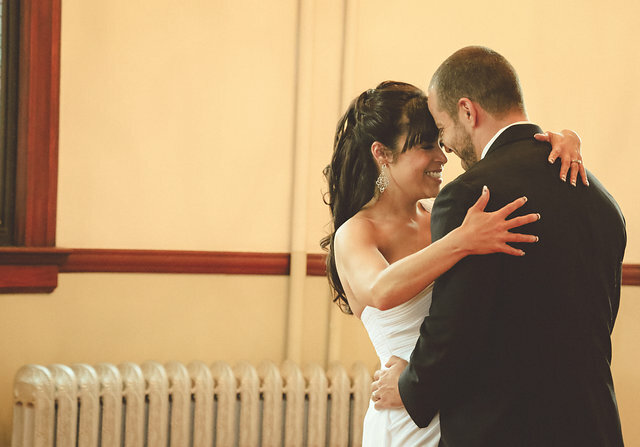 Michaela & Chris were married on March 23 in Olean, NY. The ceremony and reception took place in the historic Old Library Inn, a building bursting with history in every corner. Michaela and Chris flew in from Florida for their vows. Michaela’s brother had the honor of marrying his sister! Family and friends then enjoyed an evening of fun on what turned out to be a comfortable day in March. The first ever wedding season for Steven Wayne Productions in the Western New York area is officially here! We have weddings booked all across the region. From Buffalo to Rochester, New York and everywhere in between! 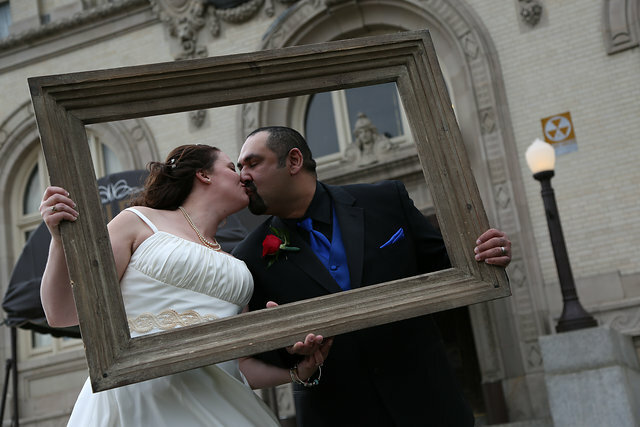 We have already captured a wedding in Olean, Buffalo, and Lackawana! We are also honored to be capturing weddings in East Amherst, Clarence, and Geneva to name a few! We absolutely love our couples and are so excited to be part of their amazing day. We will share many of the memories, photos, and videos on our blog. We are so fortunate to have the talent of Eliecia Young, Jamie Ferguson and Jon Rivera as our photographers. Be sure to check in to see what impressed us about your wedding day!